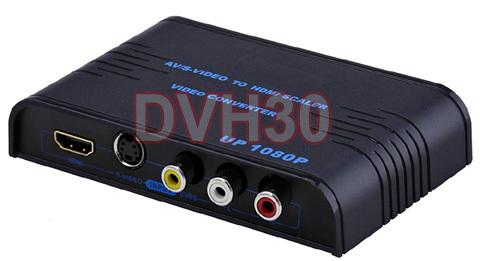 This advanced video scaler is designed to up convert analog composite RCA video and S-Video to HDMI resolution up to 1080p or computer DVI RGB resolution up to 1920x1080 pixels. All the analog interlaced 480i type videos can be enhanced to sharp and detailed images in HDMI format and HD resolution. Featured with advanced video data processing for most natural and cinema quality video for output images. 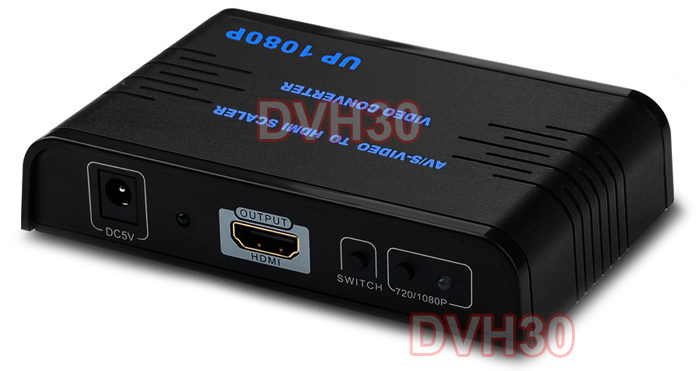 This video up converter is suitable for applications in converting the NTSC or PAL output from VCR/DVD player, cable box, satellite receiver, video game console, CCTV camera or all other standard video devices to digital HD format for display. HDMI input x 1 (pass-through only) [Note]: HDMI input will be passed through HDMI output and not scaled to 720p or 1080p. With the built-in supreme HD video engine, this digital HDMI video processor is able to accommodate all digital and analog video inputs and up converts them into digital HDMI or DVI signals for optimized image quality and sensational results. This video scaler uses advanced HD video processor with powerful 3D digital comb filter for digitally encoded images with vivid color depth. 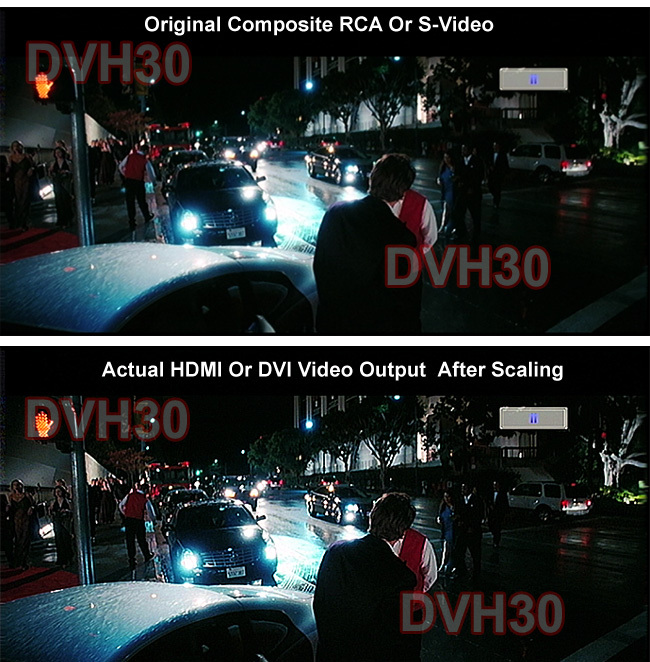 Its auto noise reduction process helps minimize artifacts and other video noises caused by unsynchronized video pluses. Enjoy the vivid color information with full color depth being presented on your big screen TV or projector. This digital video scaler adopts the latest 3D motion adaptive de-interlace processing, which can help eliminate the jagged edges of TV or DVD videos and improve the clarity and sharpness of the overall image. 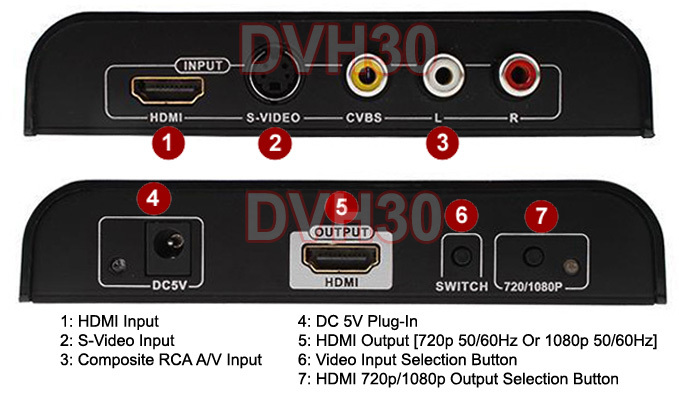 Cost efficient solution for up converting composite RCA or s-video to 720p or 1080p HDMI DVI signals for sharp and detailed display. Built with 1 composite RCA video audio inputs, 1 S-Video input and 1 HDMI input/pass-through. Supports advanced video data processing for most natural and cinema quality video for output images. Selectable HDMI output resolutions at 720p at 50/60Hz or 1280x720 pixels or 1080p at 50/60Hz or 1920x1080 pixels. Featured with premium frame-based motion adaptive De-interlacer for improving the existing standard definition video Input. Supports auto noise reduction to help minimize artifacts and other video noises caused by unsynchronized video pluses. Real time video output so the audio output from the source device can always be in sync with the converted video output from this scaler accurately. Featured with advanced HD video processor with powerful 3D digital comb filter for digitally encoded images with vivid color depth. Selectable PAL 50H and NTSC 60 Hz frame rate conversion ensures glitch-free display. Supports NTSC and PAL inputs and automatically detected. Backwards compatible with all DVI monitor displays via using HDMI to DVI adapter or adapter cable. DC 5V 1A power adapter is included.